Having a car is a good thing, you can always bring something on it or go with your family out of town. But if you have a garage, then you are doubly lucky. Today, these premises, in addition to their direct destination, are also used as basements in which you can store stocks for the winter. And if suddenly the roof began to leak, then you need to think as soon as possible how to repair it, so as not to aggravate the consequences. The process of putting roofs in order differs in two factors of complexity. 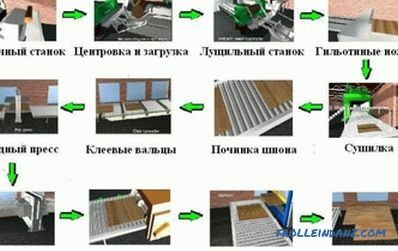 Depending on the type of material with which it is covered. The degree of wear of the entire structure. In the first variant, the place where the water flows is determined and, depending on the coating, it is eliminated locally. In the second variant, the degree of wear of the whole structure is determined and, if necessary, the entire coating is changed. Regardless of the type of work to be done, you need to take it seriously, otherwise you will not get the necessary result . 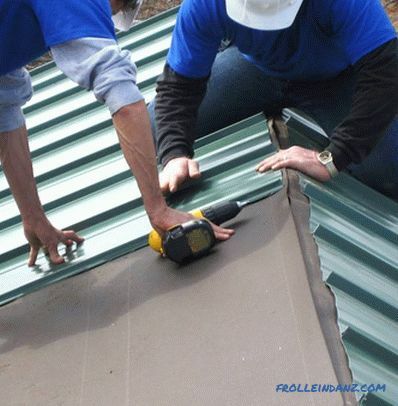 The most popular material for coating is considered roofing material or materials-analogues. Very often, such coverage can be repaired locally. To do this, it is necessary to determine the place of leakage, mainly, such a roof becomes useless if trees grow nearby, the leaves of which, accumulating on it, impede the rapid flow of water. This leads to leaf rot and leakage. Before starting work, clean all leaves and debris from the roof of the garage. The problem area must be completely cut. Since the coating is laid in several layers, it is better to cut off all layers that have been rotted so that there are no rags around the edges. When you have prepared the place, you need to melt the bitumen. To do this, we light the burner (if you don’t have it, then make a fire) and, breaking the bitumen with pieces, put it in a bucket. It is necessary to heat bitumen before it boils. Then put on mittens, take the tank and climb the stairs to the roof of the garage. 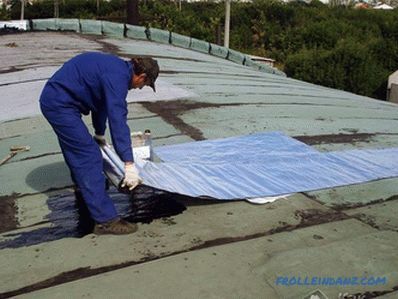 First, you need to fill in the bitumen with the repaired place to half, and after waiting a couple of hours to heat it again and pour the leak to the end, if necessary, leveling the remaining bitumen over the roofing felt. 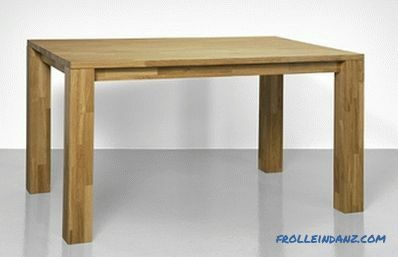 If the damage is large, you can completely replace the coating. To do this, remove one span (not completely the surface, but one or two strips of glued ruberoid) and roll out several new sheets with sealing of each bitumen. Such work should be carried out in dirty clothes, preferably with long sleeves, in order to prevent hot bitumen from getting on the skin. Such garage coverage can also be repaired both locally and completely, the main thing is correct leak diagnostics. 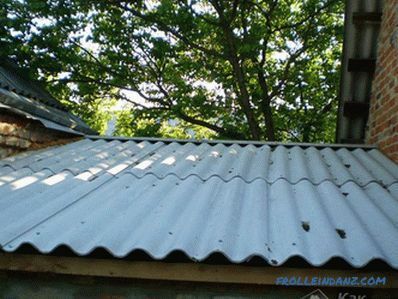 As a rule, the roof of corrugated board flows at the joints of the sheets, or on the ridge, which can be deformed by strong wind, and rainwater will fall under it. If you have to replace the sheet, you must first remove the old . Unscrew all screws and remove it from the roof. Then check the integrity of the substrate. If white spots and mold are visible on it, you need to completely remove it and put a new one. 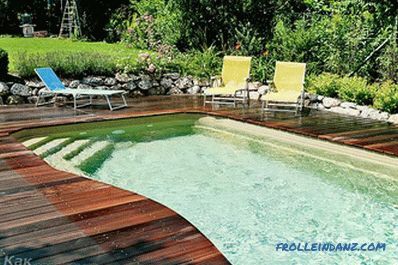 If you decide to leave the substrate (this is permissible, if it is not torn from the humidity, and there is no mold on it), then you need to leave it in the sun until it is completely dry, and then fix the decking. With the complete replacement of corrugated flooring in the garage, it is also assumed that the batten is replaced (if necessary). Profiled flooring is a fairly practical material, such a roof can last for a long time, the main thing is to carefully remove snow from it in the winter and clean the leaves from it in the autumn. Slate coatings last for a long time, but they also sometimes require replacement. They flow mainly in attachment points, because they are fastened with nails. To minimize the possibility of leakage in such places, they can be additionally shed with bitumen. The cooking process was given above, just spill every connection, that's all. If the roof of the slate is old, then in winter, with a large accumulation of snow, it may crack. And here, most likely, to get off with local repair (replacing one sheet) will not work. If the middle sheet is cracked, then you have to remove the entire span, and it’s not a fact that you remove it without breakage. If this happens, then carefully inspect the crate and, if necessary, replace the substrate, for this purpose fit roofing material. In order not to break the slate by hammering a nail, small pieces of thick rubber are put under the caps, this will also serve as an additional obstacle for moisture, which can easily leak through the bare nail cap. As a rule, iron garages are rare, but corrosion is an insidious thing and can cause problems even to such a coating. Leakage can occur at the weld seams. To eliminate it, it is enough to boil all the compounds. 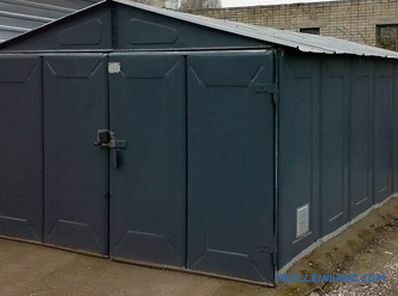 If you are the owner of an old iron structure, then for additional protection from rain, you can pave the roof with a soft roof, for example, roofing felt.